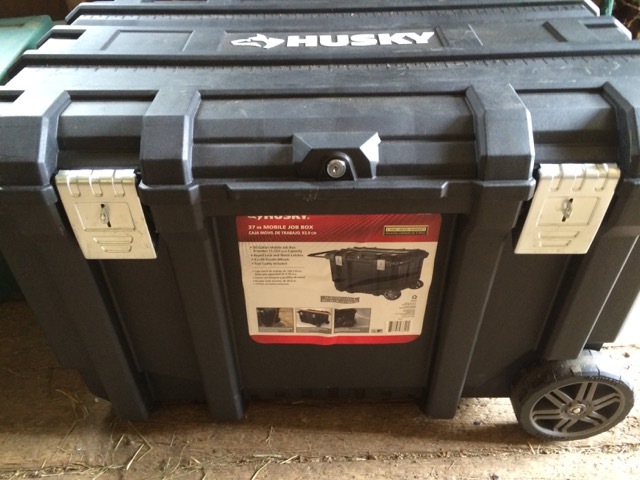 This Husky portable tool chest makes a great tack trunk. At just $64 you can even buy two. At my old barn, we had lots and lots of shelves. As with most things, the more space I had, the more I spread out. At the new barn, storage space is not quite so spacious. And my things need to be contained. I’m probably the last equestrian on the face of the earth who didn’t own a tack trunk, but it was time. This was the closest equestrian purposed trunk to what I wanted. It is described as “economically priced” at $225. (or quadruples) in price. I need a place to store stuff in a barn, not buy furniture for my house! 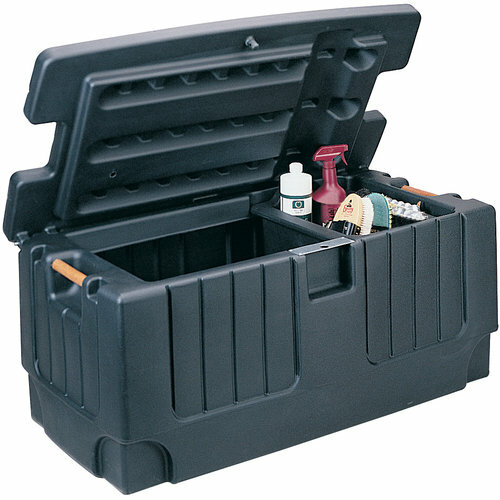 In the spring my husband bought me a tool chest for my trailer that was perfect — large enough to hold assorted bridles, girths, saddle pads, extra boots, and more; waterproof, easy to close, mouse-proof (closes tightly), and it even has a small tray, and a pull out handle and wheels, so it’s easy to move. Of course they didn’t have the same model at Home Depot this time, but this Husky Mobile Job Box really does the trick. For a mere $64, too! I just discovered this too. What a great and cost effective solution! I had planned to get one today but ran out of time. I had this husky box last year and LOVED IT!!! I was allowed to borrow a Tack locker so I returned it and immediately regretted it. But now I’m moving my Horse to a place with no lockers, so will definitely be purchasing tomorrow. It is way better quality than the Stanley version. Very spacious. Very worth it. You are not alone! My stuff is stowed in a pair of big Huskie tote.. Glad to learn about this one, as I was wondering if a tool chest would be roomy enough. Thanks! yes, that is what I have too! One in the trailer stores all feed bags, etc, one outside his pasture stores blankets/fly spray, the one in the barn stores all the little things that get lost. All for cheaper than one official tack trunk! I got my beloved Stanley trunk at Lowe’s, for SO much cheaper than my far-less-significant equestrian-specific tack trunk. It’s such a true-ism. As soon as you add “equestrian” the price goes way up! yep when i finally get around to getting a trunk it’ll definitely be from Home Depot – the stanley trunks are nice too! I was looking for a Stanley but they no longer carry them at Home Depot . . . but this is pretty nice for the $$.